, waterproofing of foundations, basements, swimming pools, parkings; construction of bridge bays; insulation of pipelines inner surfaces; for metal surfaces; for metal surfaces protection against corrosion, as well as the temporary protection of different building constructions against negative influence of moisture. Petroleum bitumen and organic solvents forming the primer are the products of the highest quality. They impenetrate materials and dry rapidly. These material properties ensure reliable and qualitative adherence of coating with dusty, open-textured and rough surfaces that allows to form a strong and long-lasting layer of waterproofing. 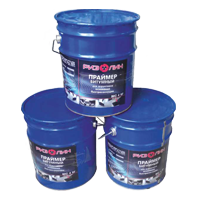 Bitumen primer does not contain any inclusions and inhomogeneities as well as toxic solvents. The application of readymade composition reduces the price of building works, cut time and increase work performance speed. Can be applied in all climatic zones (according to SNiP 23-01-99). All activities must be carried out in well ventilated rooms. Readymade primer does not need any preliminary procedures, excluding thorough mixing. It must be spread onto a cleaned surface with special capron brushes, rollers or paintbrushes taking into account consumption rate: 0,25-0,33 l/m2. ATTENTION: Bitumen primer should not be used close to open flames. Store it in a dry place away from the sunlight.